“I’ve found that non-Chaldeans actually really love the Chaldean wedding traditions. They love our music, dancing and they like to get involved,” said Suhair Kallabat, event/wedding planner and owner of Eventfully Yours. Many of the rituals are very easy to incorporate and begin at the church ceremony. “Most of the Chaldean traditions are ceremonial. For instance, the arm bows and crownings are a must have and are easily done,” explains Dalia Atisha, event/wedding planner and owner of The Event Planner Inc. The arm bow, placed by the priest on the groom’s left arm as part of the ceremony, is considered a Sacrament with much significance and an es­sential part of a Chaldean wedding ceremony. “It’s a very similar presen­tation as the wedding ring. It repre­sents eternity,” Atisha added. The crowing of the bride and groom is another important Chaldean wedding ceremony ritual and also has its own significance liturgically. “It represents the bride and groom being first in each other’s lives. They are their own king and queen, form­ing their own kingdom,” explained Atisha. Some Chaldean traditions are very similar to American ones and can be blended quite easily and even add extra flair to the event. “The Chaldean community has become very westernized. So, it’s re­ally not that difficult to combine the two cultures with their traditions,” Atisha said. For instance, it’s both American and Chaldean tradition to introduce the bride, groom and wedding party as they enter the reception. The Arabic Zeffa just makes that American tradition a lot more fun and festive with dancing and tradi­tional, Chaldean Khiga music. It has evolved to include the cutting of the wedding cake. “There used to be a separate Zeffa later in the night for the cake cutting, but people have found that it takes too much time away from the other activities. So, we’ve incorporated both into one,” explained Atisha. “The Zeffa is a must have, even if just one of the couple is Chaldean,” she added. Ronza Novelli is a Chaldean who was born in Iraq. She grew up attending weddings of her culture and always dreamed of having those traditions at her big day. Despite her husband, Ezio, being of Italian decent, she managed to successfully combine elements of both cultures at her recent wedding. “We hired a dance group called Arabian Knights to perform the Zef­fa. They wore traditional costumes. We just love the Middle Eastern dancing and drums. That’s some­thing that I absolutely had to have,” Novelli explained. The effort to successfully com­bine Chaldean and American wed­ding traditions has left the more pas­sé American traditions in the dust. There’s no need to plan time for the receiving line and bouquet and gar­ter toss. “Those are things that are hon­estly becoming extinct in our Chal­dean community,” Atisha said. “Ac­tually, the bouquet and garter toss is being phased out of American wed­ding traditions as well. We’re seeing it less and less,” she added. Novelli chose to include a bou­quet toss at her Chaldean/Italian wedding, but did not do the garter removal or toss. “I really don’t think that’s appropriate for a Chaldean wedding,” she said. Foregoing some of these fad­ing American traditions also allows more time for the often lengthy, Zeffa and line dances that not only make your Chaldean guests happy, but your non-Chaldean guests will love them, too! “I’ve noticed that the non-Chal­dean wedding guest absolutely love and look forward to the line dancing. They are on that dance floor, want to learn and are embracing it just as much as someone who has been do­ing it forever,” Atisha explained. The Chaldean traditions of danc­ing with the Yalekhta and Kopala also make for a stunning, visual im­pact that is rich with ancient culture. “There is so much culture in the Chaldean community. People, es­pecially the millennials, love that! They want to be a part of it,” she added. So, the more Chaldean and Mid­dle Eastern music, the better, as it only enriches the event and keeps guests dancing all night long. “Music stirs the soul. People love the flutes, drums and Middle Eastern dances,” agreed Kallabat. In fact, most, if not all, Chal­dean/American wedding receptions include both a traditional Chaldean band to play traditional music and dances and a deejay to spin the popu­lar American dance hits. “Most Chaldean bands actually come with a deejay to make blending to the American and Arabic cultures easier. It’s a way to kill two birds with one stone,” Atisha said. 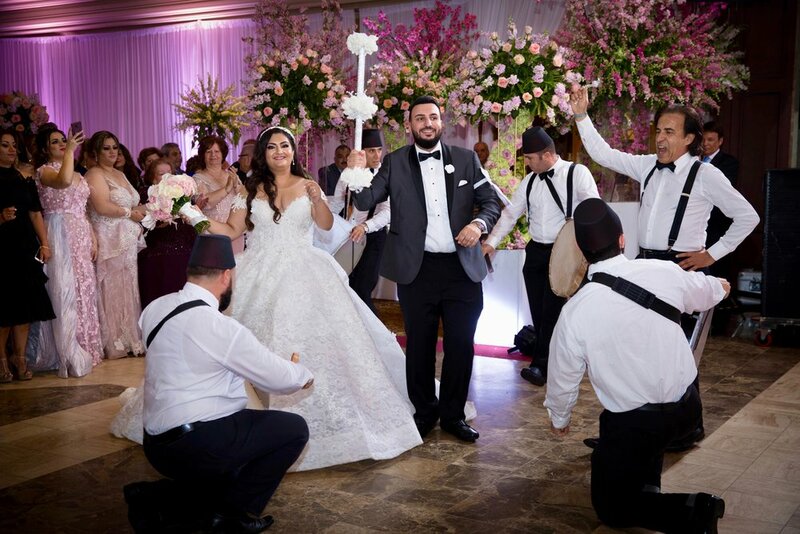 For Novelli, this allowed her to accommodate both her Chaldean family and new Italian family with traditional music that they are accus­tomed to at wedding receptions. “We had the deejay play all the dif­ferent Italian songs and opera singers that my husband’s family know and like,” Novelli explained. “I know that weddings are for the bride and groom, but I tried to make sure that all of my guests were happy,” she concluded. There are many more ancient Chaldean pre wedding traditions that can be performed. It’s all about what traditions are deemed essential to your family and important to the bride a groom. “It’s all about customizing. Wed­dings are as unique as each individ­ual couple. Do what’s right for you,” Kallabat concluded. An experienced Chaldean/ American or even a non-Chaldean wedding planner with experience planning Chaldean weddings can help you make the right choices to help make everyone happy and cre­ate a special day that’s full of fun and rich with culture and tradition.